Our writer this month, Denise Pulley,who gardens in Huntington Beach and is a member of the Board of Directors for the Mary Lou Heard Foundation. Just about finished here in Southern California is what we call, "Bare Root Season". This is the time of the year when we look forward to purchased shipments of certain berry varieties, fruit trees, roses and vines, or we purchase from our local nursery, or home improvement store for planting in the garden. For me, I love to study the stock that comes into our local home improvement store, and usually make a purchase of a few apple trees for espaliering later. An "Ultra Dwarf Fuji" is usually my selection. It is a very ornamental and sweet crisp apple and generous bloomer in our coastal garden. "Anna" is another favored variety that is also a good performer. I say "coastal garden" because most trees require chill hours for blooming in the spring. Chill hours refer to the cumulative hours of weather below 45 degrees during the dormancy cycle of a tree or shrub that will affect its blooms. For example, our chill hours in Huntington Beach versus chill hours in north Orange County have less consecutive cooler hours. Pronounced "es-pal-yer", or "es-pal-yay" the word is rooted from both the French and Italians who defined this art which originated in ancient Rome. It is a shrub or tree that is trained to grow against a flat plane, like a wall, fence or a trellis. The Romans began this technique to take advantage of the heat provided from south facing walls during cool weather, prolonging the bloom cycle to provide a heavier harvest later. In garden design, espaliers are used to define a specific area by creating a living wall or screen; take advantage of limited space; provide some verticality; all the while being multi-functional for providing attractive Spring blooms and bearing edibles in the Fall. You will see a wealth of successful artistic brancing images on the internet. 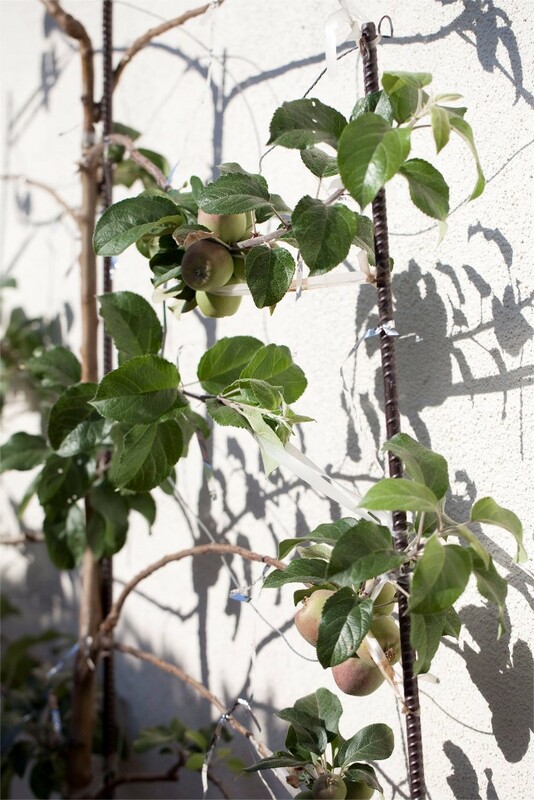 The retail purchase for an already trained espalier at the nursery is about $230.00. 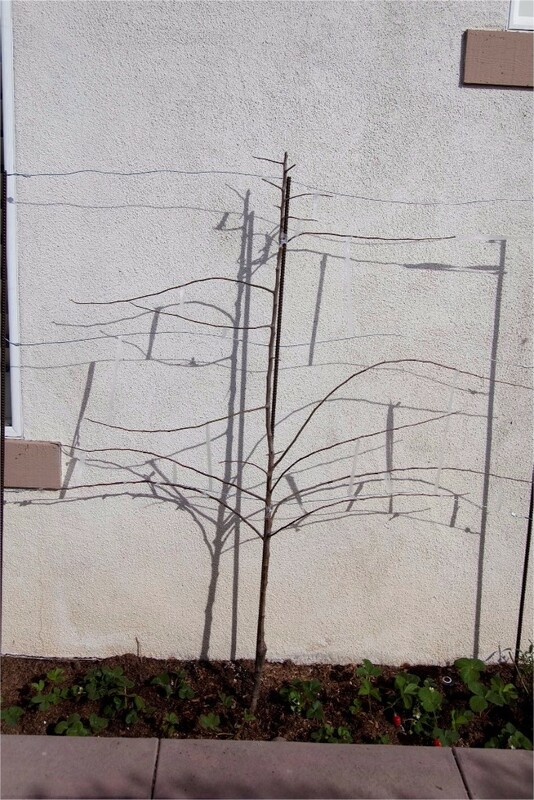 For approximately $40.00 you can make your own espalier: $20 out-the-door for your tree, $5.00 for the bag of planting mix, and $15.00 for three 6' pieces of rebar which will be used for support. 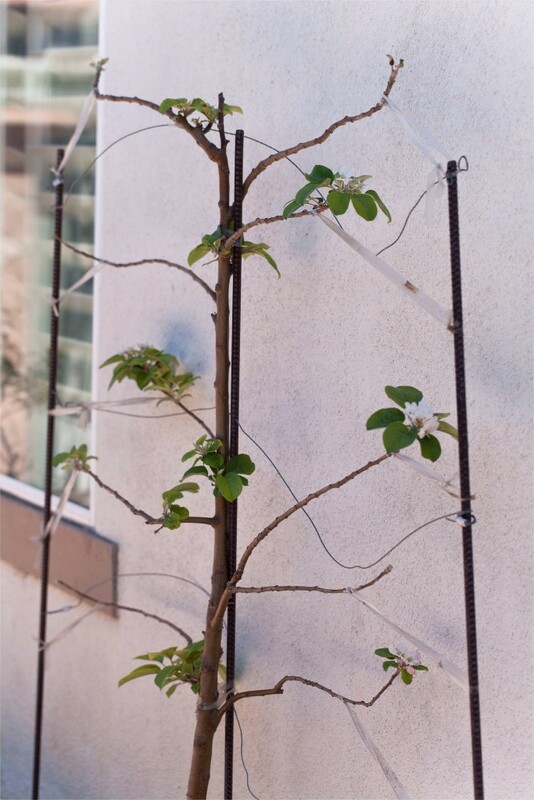 You will also need some plastic tape for tying, and if you choose, you can add wire to the rebar for framing and tying the branches to. My preference is to not use the wire because during dormancy it distracts from the beautiful frame being created. Start training the branches by tying them to each other, practice a bit of patience, and you will soon see how proficient you become in creating your living sculpture. One piece of rebar is the "backbone" - hammer in behind the base of the tree. The other pieces are hammered approximately six feet apart from each other's end. Use the tie tape to start the training process. 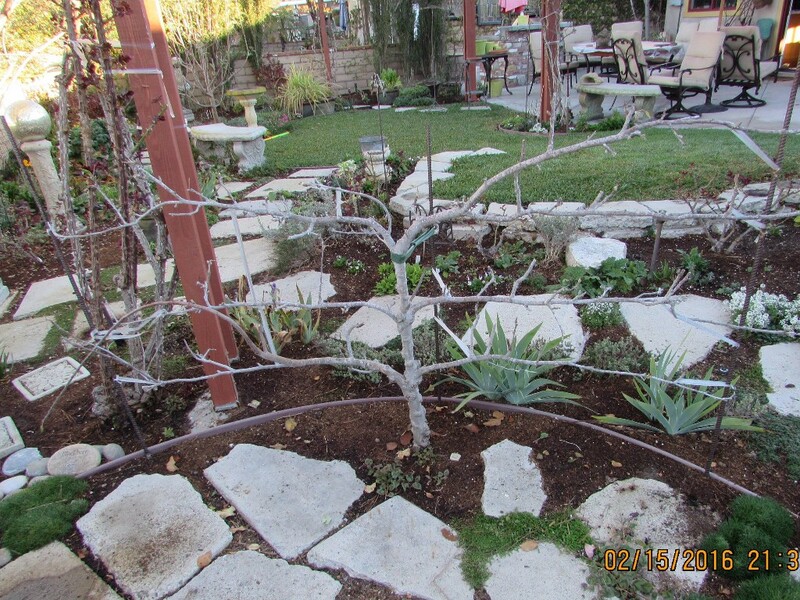 The attached photos show newly purchased "sticks" at planting time, first year, second year and third year taken from the garden of Sandra Austoni (please do a web search on her - she's an incredible artist!). The last photo is of the tree in our garden which is now eight-years old. Give yourself a small gardening challenge and become an "arbre artiste". There are still some bare roots out there! Copyright © 2016 Mary Lou Heard Memorial Garden Tour, All rights reserved.